It is with a heavy heart that I am announcing my departure from Purple Frog Systems. It has been just shy of 2 wonderful years with the Shropshire based company, but it is now time to move on to pastures new. I joined Purple Frog Systems in March 2016 following an intense round of interviews with the lovely husband and wife team (Alex and Hollie Whittles). We discussed our favourite Star Wars film, my grumpy tendencies and how I felt about the colour purple! 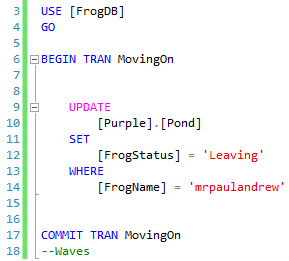 After clearing up the important stuff, we looked at a few SSIS packages, then argued about if comma’s should appear at the start or end of fields in your SELECT statement list, they should be at the end! Later we unanimously concluded that we were right for each other, even though the comma thing remains unresolved. Having risen through the ranks at Purple Frog (pond scum > tadpole > frog) I now find myself at the door step of a new consultancy, Adatis, ready to start the next chapter of my career. I confess a mixture of emotions as with all big decisions, but I know deep down this move is right for me. On Friday 2nd March 2018 I’ll officially become a Senior Data Analytics Consultant at Adatis ready to start my first week in my new job by flying over to Seattle for the MVP Summit! Immediately following by SQL Saturday Iceland. Not a bad start. Good bye Frogs, may our paths cross again in the future.